Ar dtús, cuirimid fáilte is fiche roimh do chlann go Gaelscoil Uí Earcáin. Tá súil againn go mbeidh blianta taitneamhacha thairbheacha ag do pháiste linn. Ní dhéanann páiste dearmad ar an gcéad lá ar scoil. Is féidir libh cabhrú chun é a dhéanamh an-sona dóibh. Labhair leo faoin scoil roimh ré go neamhfhoirmiúil, ag déanamh tagairte dó mar áit sona ina mbíonn fáilte mhór rompu ann, agus go mbuailfidh siad le cairde nua ann. Ná húsáid scoil nó múinteoirí mar bhagairt mar go gcuireann sé seo imní ar pháistí uaireanta. Cóta agus mála a aithint, a oscailt agus a dhúnadh gan stró (moltar ainm an pháiste a scríobh go soiléir ar gach rud a bhaineas leo). Muna féidir le do pháiste a chuid iallacha a dhúnadh, tá bróga le Velcro ar fáil. An leithreas a úsáid le féin agus cead a lorg chun dul go dtí an leithreas. Lámha a ní agus a thriomú tar éis dul ag an leithreas. Bréagáin agus cluichí a roinnt le páistí eile agus bheith in ann fanacht lena s(h)eans féin a thógáil. Glanadh suas ina d(h)iaidh agus bheith in ann bréagáin agus fearais a chur ar ais san áit ceart. Is féidir leis an gcéad lá ar scoil a bheith an-dian ar an bpáiste agus ar na tuismitheoirí! Nuair a thagann siad go dtí an rang, bí chomh réchúiseach agus is féidir leat. Buailfidh said leis an múinteoir agus páistí eile agus cuirfear ag bord iad. Cabhróidh sé linn má fhágann tuismitheoirí an rang chomh tapaigh is féidir don chéad cúpla lá ar scoil. Tugann sé seo seans níos fearr dó/di socrú síos agus dul i dtaithí ar an tréimhse nua ina s(h)aol! Uaireanta, in ainneoin gach iarracht ó thaobh na tuismitheoirí agus an mhúinteora, is féidir le roinnt páistí a bheith trína chéile. Má tharlaíonn sé seo do do pháiste ná buailfeadh driopás tú. Is féidir teacht timpeall orthu le ham, foighne agus buanseasmheacht. Bí diongbháilte ó thús. Fiú má bhíonn páiste trína chéile, cuir faoi deara dó/dí go mbeidh orthu fanacht ar feadh tréimhse gairid ar a laghad. Ní cóir dóibh mothú go bhfuil an lámh in uachtar acu go siceolaíoch. Bíodh muinín agat sa mhúinteoir. Tá sé/sí seifthiúil agus tá taithí aige/aici le bheith ag déileáil le gach sórt fadhbanna sa rang. Tar éis iarracht a dhéanamh do pháiste a chur ar a s(h)uaimhneas, fág an rang go tapaigh. Is féidir leis an múinteoir aigne an pháiste a bhaint díot nuair a bhíonn an tuismitheoir imithe. Déan iarracht gan do mhothúchain a thaispeáint do do pháiste. Uaireanta bíonn an tuismitheoir níos corraithe ná an páiste agus cuireann sé seo inmí ar an pháiste. Is féidir glaoch a chur ar an oifig chun cinntiú go bhfuil do pháiste tar éis socrú –de shíor bíonn rudaí ciúinithe go maith. Bí cinnte iad a bhailiú in am. Is féidir le páiste bheith an-corraithe má mhothaíonn siad go bhfuil siad tréigthe. Déan cinnte, má tá athrú sa ghnáthamh bailiúcháin, do pháiste agus an múinteoir a chuir ar an eolas faoi. Cinntigh go bhfuil bricfeasta maith ag do pháiste roimh theacht ar scoil. Deirtear gurb é an bricfeasta an béile is tábhachtaí sa lá. Ba cheart do pháiste bheith ag fóghlaim conas cabhrú agus ba cheart dó/di struchtúr a bheith aige/aici ina s(h)aol. Tabhair postanna simplí dó/di gach lá – fásann féinmhuinín an pháiste as bheith in ann tascanna beaga a dhéanamh. Tabhair tacaíocht do do pháiste an méid agus is féidir leat le labhairt na Gaeilge. Dá laghad do chuid Gaeilge, úsáid í an méid agus is féidir sa bhaile agus i dtimpeallacht na scoile. Léirigh meas don scoil i gcónaí leis an bpáiste. Má tá deacracht agat leis an scoil, cuir in iúl don scoil é tú féin. Má bhíonn tuismitheoirí ag caitheamh anuas ar an scoil ós comhair a gcuid páistí, téann a leithéid i bhfeidhm go mór orthu. Bíonn tionchar mór ar pháiste ag gach a chloiseann siad ó dhaoine fásta agus conas mar a deirtear é. Léirítear an tionchar seo uaireanta sa chaoi a n-oibríonn an páiste leis an múinteoir, agus uaireanta sa chaoi go cuireann sé/sí as don rang. Taispeáin meas ar fhoireann na scoile agus an obair atá a dhéanamh againn sa scoil. Osclaíonn an scoil ag 8.50 r.n. tá sé tábhachtach go mbíonn na páistí ar scoil in am. Osclaítear an geata ag 8.40r.n. Má thagann do pháiste ar scoil idir 8.40 agus 8.50, bíonn air/uirthi suí i líne sa halla go dtí go mbuaileann an clog ag 8.50r.n. Cuir in iúl don scoil aon athrú a thagann ar do shonraí pearsanta – cuirfear bileog eolais abhaile le líonadh do gach pháiste sa chéad seachtain ar scoil. Is anseo go mbeidh tú in ann daoine a ainmniú chun do pháiste a phiocadh suas. Tá sé tábhachtach an fhoirm seo a líonadh ina iomlán agus é a chur ar ais chuig an scoil chomh luath is gur féidir. Ná déan dearmad a chur in iúl dúinn má athraíonn do sheoladh nó uimhir teileafóin i rith na bliana. Uaireanta, athraíonn cúrsaí sa suíomh clainne (m.sh. scaradh, bás, tinneas srl) agus bíonn éifeacht aige seo ar iompar/dul chun cinn an pháiste. Tá sé an-cabhrach don scoil eolas mar seo a fháil chun cabhrú linn má thagann athrú ar an bpáiste. Beidh aon eolas faoi rún dár ndóigh, agus beimid ábalta cabhrú leis an bpáiste mar go bhfuil tuiscint againn ar a s(h)uíomh. 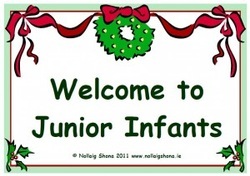 Firstly, we would like to take this opportunity to welcome your family to Gaelscoil Uí Earcáin. We hope that your child will have many enjoyable years while they are with us. The child’s first day is a day to remember for the rest of their lives. You can help to make it a really happy one for them. Tell them about school beforehand, casually, and talk about it as a happy place where there will be a big welcome from them and that they will meet new friends. Don’t use school or the teacher as a threat as this can make children very apprehensive. Recognise their own coat and bag and open and close coats and bags by themselves (we strongly recommend that all personal belongings are clearly labelled).If your child cannot tie laces, then Velcro fasteners are a better option. Use the toilet without help and know how to ask for permission to use the toilet. Wash and dry their hands after using and flushing the toilet. Share toys and resources with other children and ‘take turns’. Tidy up and put toys and resources away after use. A child’s first day at school can be traumatic for both the child and the parents! When they arrive at the classroom be as casual as you can. They will meet the teacher and the other children and will be shown to their chair. For the first few days of school it will help if the parents leave the classroom as quickly as possible. This gives him/her a better chance of settling down quickly and adapting to the next new phase of his/her life! Sometimes, in spite of the best efforts of both teacher and parents, a small number of children will become upset. If your child happens to be one of them don’t panic – patience and perseverance can work wonders! You must be firm from the start. Even if a child is upset you must insist that they stay for a short time. They must never feel that they are winning the psychological battle of wills. Trust the teacher. He/ she is experienced and resourceful and is used to coping with all kinds of starting off problems. When you have reassured them, leave the classroom as fast as possible. The teacher can distract and humour them more effectively when you are not around. Try not to show any outward signs of your own distress – when parents are upset it only adds to the child’s anxiety. If necessary, phone the office to check on your child – you will invariably find that they have settled, in your absence, and that calm has been restored in the classroom. Be sure to collect them on time. Children can become very upset if they feel they have been forgotten. Please remember that if at any time the collecting routine has to be changed that you inform both the child and the teacher. Make sure they have a good night’s sleep. This helps your child concentrate better in school. Make sure your child has something to eat before coming to school. According to nutritionists, breakfast is the most important meal of the day. A child needs to learn how to be helpful and to have structure in his/ her life. A child should be given simple chores to complete each day – success with small tasks heps children to gain confidence. Support your child’s use of Irish whenever possible. However little Irish you have, use it where possible in the home and in the school environment. Support your child’s school in conversation with them. If there is a problem the school needs to hear it from you. If your child hears your speaking badly of the school, they are influenced by this. They are strongly influenced by what they hear their parents say and how it is said. This can present itself in school in the way the child works (or not) with the teacher and sometimes in the way a child disrupts the class. Please show respect to members of staff and the work being done by the school. The school opens at 8.50 a.m. it is important that the children arrive to school on time. The main gate opens at 8.40 a.m. if a child is in the hall between 8.40 and 8.50 they must sit in their lines until the bell rings at 8.50 a.m. Inform the school of any change in relevant personal details – An information sheet will be sent home for every child in the school during the first week of the new school year. It is on this form that you will be able to nominate people to collect your child from school. It is very important that you fill the entire form out and return it to the school as soon as possible. Please remember to inform the school of any change in relevant personal details (address, telephone number etc.) should they occur during the year. Sometimes, change within a family situation (e.g. separation, bereavement, illness etc.) affect how a child behaves/performs in school. Any information of this nature divulged to the school will be treated confidentially and will help us to understand and assist the child through any difficulties that may arise.